With an oeuvre of some six thousand five hundred drawings to date, James Wong is immersed in his invented worlds at war. 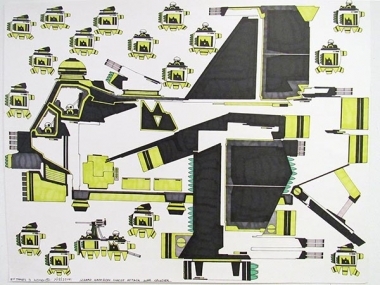 Each military force is complete with its own logo, transportation fleet, war machines, arsenal, and personnel. Intense color, bold design and minute linear details are the calling card of James’ work. Drawings are created first with a black marker outline and templates, then followed by intense coloring into the wee hours. 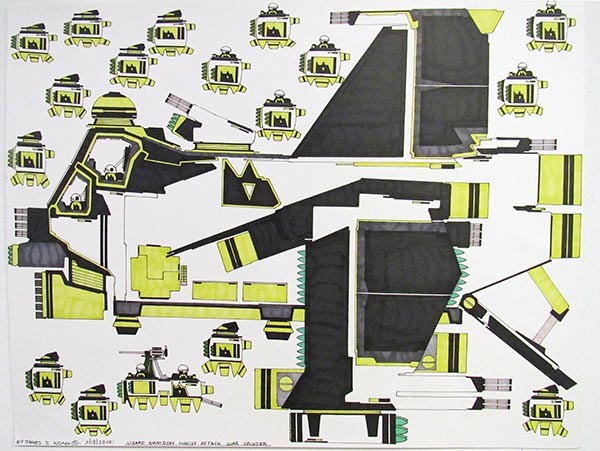 In the artwork of James Wong, the iconography of model airplanes, comic books, and architectural blue print drawings merges with game design, avatars and war technology.